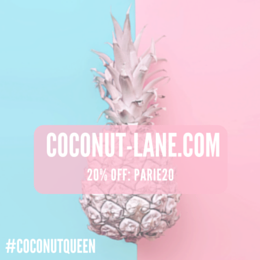 Every so often, I come across new brands on instagram that people are loving. GWA also known as Girls With Attitude (what a name!) are a brand that I am always seeing on my time line. When the chance came up to try some of their products, I got very excited. Discovering new brands that aren't available anywhere is great as you know the products are pretty much 'exclusive'. Saying this, I am sure that I spotted them in Primark a few weeks back. 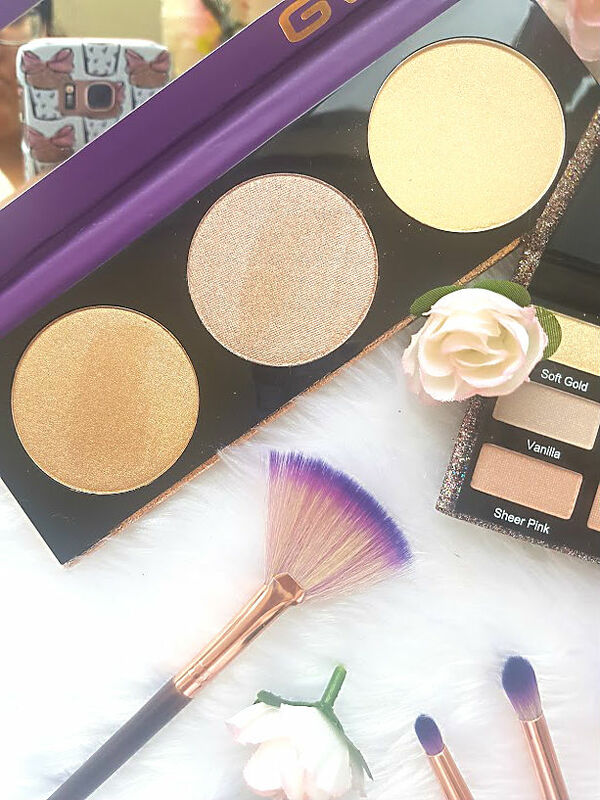 One thing that drew me to all the products first and for most was the packaging, the palettes are just stunning to look at and have in my collection. The eyeshadow palette is covered in glitter, it has been super glued on and coated over as nothing seems to come off no matter how much you try. The packaging is very luxury and makes me love the brand even more. Over the last few months, I have become slightly obsessed with lashes - to point where sometimes I will just sit and sort them all out. Granted that I do not know how to apply them correctly, but they make me feel so extra and I love it. These lashes, I haven't got around to wearing as of yet as they are a little too much for everyday. As soon as I do get round to wearing them, expect a full glam post including them. The Princess(left) are very fluttery, the further out you go, the thicker they get, which are super flattering as they wing out. Then we have Aphrodite (right) which are the ones I will be getting the most use out of as they are so wispy. 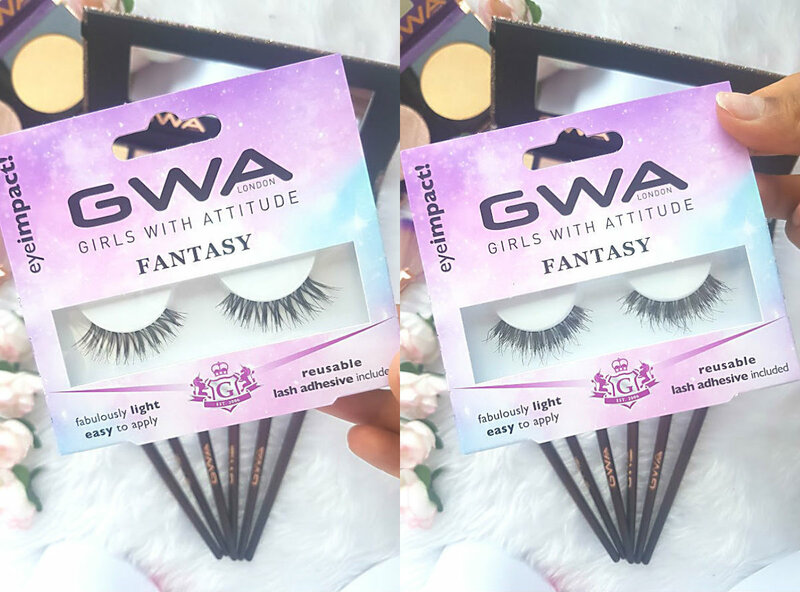 Lashes from GWA retail at only £5.49, which compared to others are super affordable. Keep an eye out for a look featuring these soon. Inside the very glittery cover we have 18 gorgeous eye shadows, ranging from matte and shimmer to metallic, to help create a range of different looks. It is a very warm toned palette, perfect for anyone with my skin tone or with a slight warm undertone. I love the range of shades in this palette, it is super easy to create day and evening looks. If you look at the palette as different columns, it will be easier to follow this next bit. The first two columns are very light/barely there shades. On my eye lids and in the swatches they don't show up very well, far too light for me but great shades to use as transitions or blending compared to all over the lid. The next two columns are my obsessions, they work so well with my skin tone and undertone. New Rose and Copper are just two absolutely BEAUTIFUL shades. The final two columns are perfect for the evening, they create a great smokey eye and the shade Smoke is perfect to take under the eye and the outer corner. Overall, the entire palette is stunning and well worth the invest. 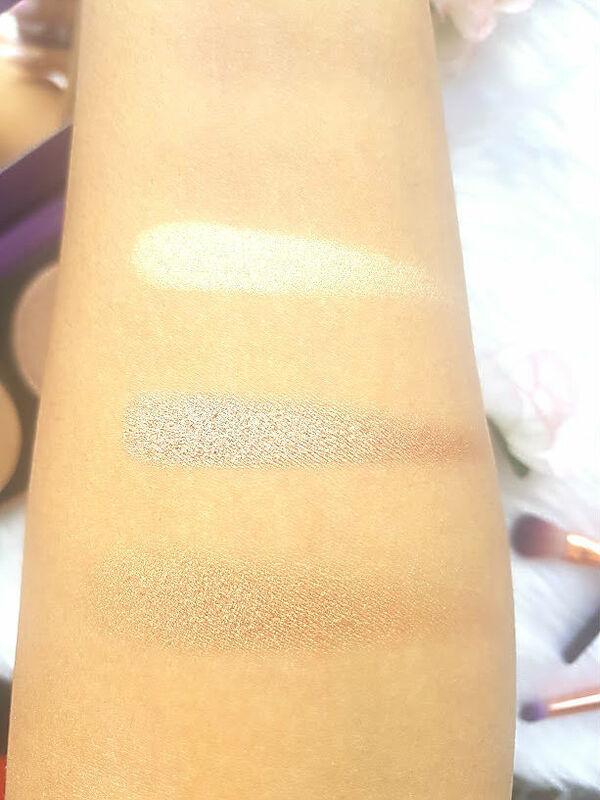 Each shade is very pigmented and each shadow is velvety smooth. 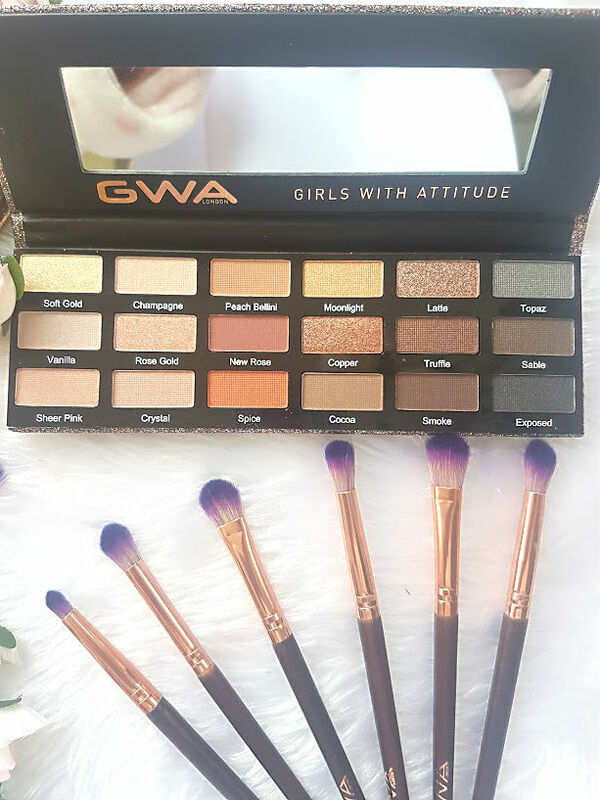 This is a great palette to travel with and will be coming with me this weekend on my adventures! Eyeshadow brushes are something that I am always lacking on, never seem to have the right ones or enough when I need them. 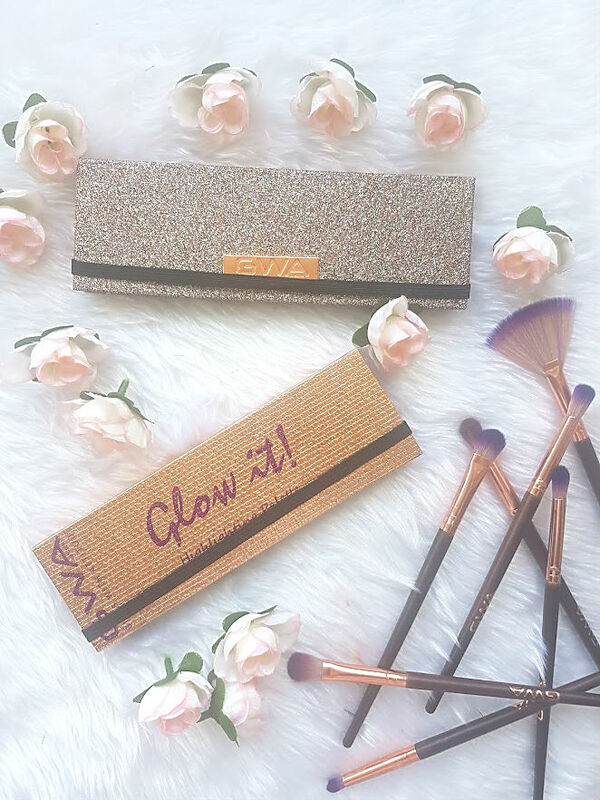 This set solves all your blending, smudging and packing on colour problems,the set contains six brushes that are perfect to create a multiple of different looks. Not to mention they are so blogger friendly, with ombre brush heads and rose gold detailing. In the set you have a blending brush, two shading brush, two crease brushes and a buffing brush. Did I need all these brushes? Probably not but a girl can never have too many right. Out of the set I am in love with the point crease brush and blending brush. I have only been using these two brushes when it comes to creating some looks as they are so versatile and easy to use. They are all so fluffy and pick up just the right amount of colour. There is no point beating the bush with this product, I am just going to tell you straight - this palette is incredible. I couldn't quite believe my eyes when I first opened it up, inside you have three highlighters and a very decent sized mirror. These shades will suit anyone, no matter your skin tone or highlighter liking. Each contain light reflecting particles, so when it hits the light BOOM. 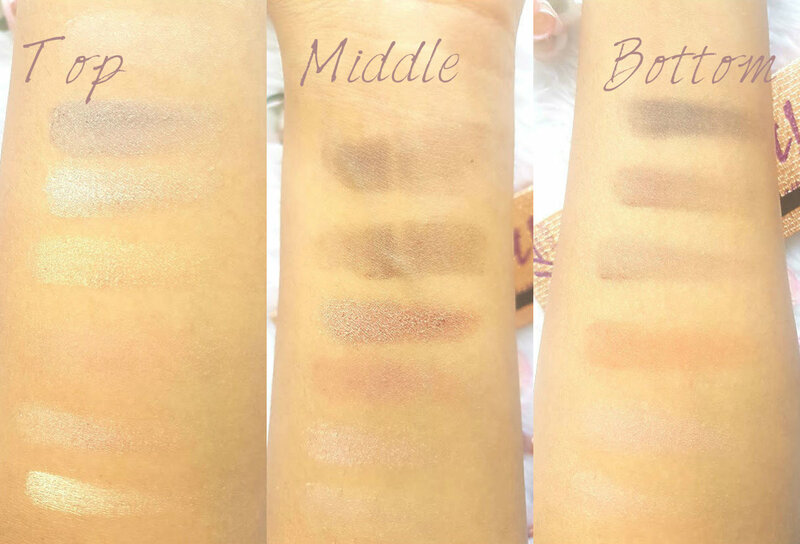 The swatches below have been done with just one finger swipe and they are so pigmented, this is exactly how it applies on the face- very full on. If you prefer a more subtle offering of highlighter then the fan brush £6.99, is the best tool to use, as it doesn't pick up very much product and will allow you to apply a tiny bit at a time rather then a lot. I've been loving mixing the three shades together and then applying to my cheekbones and nose, it honestly looks stunning. I am so impressed by everything I have tried from GWA. I have my eye on their liquid lipsticks next, they look amazing! Be sure to check GWA out here. 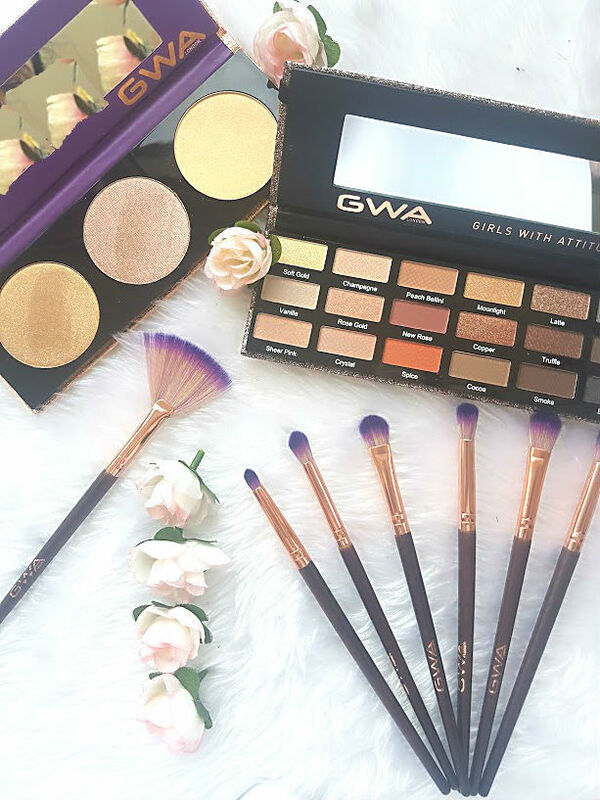 Have you tried anything from GWA? !